There are two common types of moths that damage clothing and fabrics, the Casemaking Clothes Moth and the Webbing clothes moth. It really doesn’t matter which type of moth you have, you just know that you need to get them under control and save your clothing. It is always good to know your enemies, however. Cowleys Pest Services specializes in the removal of all types of clothing moths in areas throughout Mercer, Ocean, Monmouth, Middlesex County. If you are experiencing a problem with moths eating away at your favorite sweater or any other articles of clothing, contact us today! The Casemaking Clothes Moth is named for the silken case spun by the larvae. An adult is tan to light brown and can be up to one-half inch long. There may be three darker spots on the wings. This entire larval unit moves as the larva moves. The Casemaking clothes moth prefers warmer climates; however, with the comfort of heated rooms, the moth does well in most climates indoors. Females may lay up to 85 eggs on natural materials such as wool. They prefer materials of animal origin but will feed on plant items such as herbs, food items, and natural fibers such as rope. Development from egg to adult can take from six to fifteen weeks. Larvae feed on the food materials and drag along the “case” as they move from area to area of the food source. Damaged materials appear that the fibers were scraped away from the cloth so that there is an appearance that the material is threadbare. 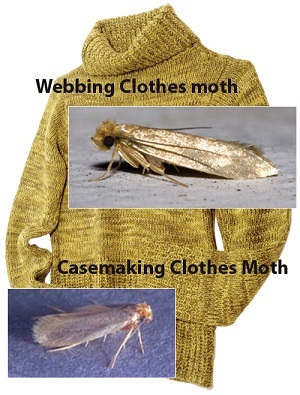 The Webbing Clothes Moth is the most common clothes moth found domestically. Adults appear similar to Casemaking Clothes Moths but have no spots on the wings. Webbing clothes moth adults also have a tuft of red hairs on the top of the head. While most homeowners will never be this close to an adult moth to compare hairs, if ?specimens are found, you might be able to see the red hairs. The Webbing Clothes Moth spins a web that can appear to be a flat silken small mat. The moth larvae feed on materials of animal origin including furs, woolens, feathers, and even in food products such as ?dried milk. The total life cycle can take from as little as a month to several years depending on the food source and conditions. This pest is most devastating to furs as they will cut off the hairs of the fur at the hide level leaving “blotches” or patches of missing fur. This type of pest is the reason that many furs are held in storage in the off-season. If you see suspicious holes in fabrics or if you see webbing in clothing, contact us for a thorough inspection. After we inspect the closets, storage areas, and the fabric, we will be able to tell you whether it appears that you have an infestation. If you do have an infestation, our trained professionals are equipped to track the source. Then a targeted treatment can be done using products directed only at the infested area. This means minimal disruption for you and will lead to peace of mind protecting those beautiful natural fibers! Call or contact us online today for a free estimate on Clothes Moths removal and other pest removal services. We proudly service the areas of Woodbridge, Edison, Lakewood, Toms River, Brick, Trenton, Piscataway, Old Bridge, Middletown, Princeton Junction and nearby! Where do Carpenter Ants Build Nests? Fleas: What can Cowleys do? What is Cowleys Stink Bug Program? How Do Ticks Find a Host? What Diseases Do Ticks Carry?